CIVIL WAR SOLDIER IN UNIFORM. HANDSOME, BEARDED YOUNG MAN. TINTED AMBROTYPE. CIVIL WAR SOLDIER IN UNIFORM. AMBROTYPE, 6TH PLATE, HALF CASE. 1/4 Plate Civil War Ambrotype of Union Soldier in Frock Coat - Missing Fingers? CIVIL WAR SOLDIER IN UNIFORM. TINTED AMBROTYPE, RUBY GLASS, 9TH PLATE. 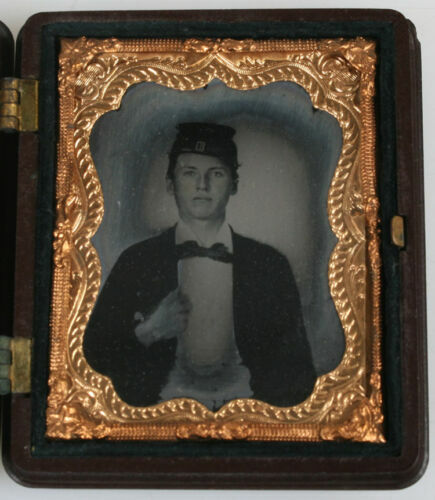 Well Dressed Man Ambrotype Photo in Case - Missing Finger - Injured Soldier? 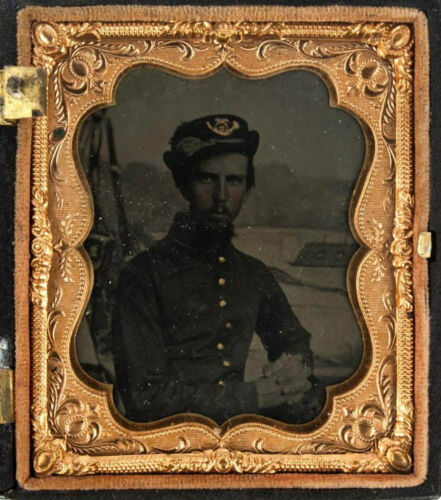 CIVIL WAR AMBROTYPE. SOLDIER IN UNIFORM. TINTED 6TH PLATE, FULL CASE.